When visiting Prague the first question many people ask themselves is, “What is there to do in this city?” For many it is visiting ancient ruins or other old buildings. For others it is taking a bite out of the local cuisine and enveloping the local culture. But for me I like to kick it up a notch and find somewhere I can go and party till the sun comes up. In Prague this place is the Wenceslas Square. The Wenceslas Square is the place to be when visiting Prague. One of two main squares, the other being the old town square, the Wenceslas Square is your place to find everything and anything in Prague. When entering the square you will find banks, apartments, hotels, restaurants, bars, clubs, shops and more. You will see people hustling and bustling through the square selling good and services as well as coming and going to work. When visiting the square you will want to take your time and really pace yourself. You will want to keep your eyes out for those special deals as well as those looking to take advantage of a tourist. When visiting the square make sure that you go with someone not only for the pure enjoyment of experiencing what Prague has to offer but for protection as well. With the square being one of the main points of interest in the city you may feel overwhelemed by what the square has to offer. Take your time and plan your day well. I suggest showing up early before the crowds begin to form and take stock of what is in your area. When visiting the square you will see many local merchants trying to gain your business. If you find something that you like try to haggle with the merchant to see if you can get a better price. Also, be weary of “authentic” merchandise when shopping in the square. There are good business people as well as crooks. When traveling through the square make sure to step in for a cold beer and a bite to eat in one of the local restaurants and bars. Take note of the different options and prices that you see, this is a major shopping area and deals can be made as well as overlooked for those who take the time to find them. And finally, after spending your day shopping and taking in the culture you will want to visit the square when the sun goes down and the lights shine bright. The square is your number one place to let your hair down and really soak up the culture. 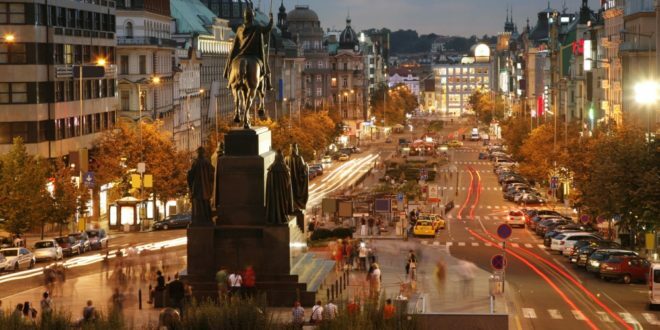 So if you are looking to the hottest place in Prague you don’t want to pass up the Wenceslas square, you haven’t visited Prague until you visit here.